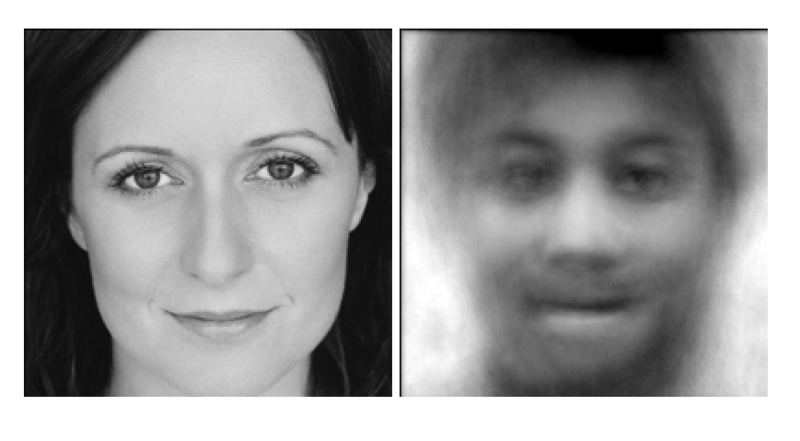 Our site FaceField.org (and now the iPhone app) uses the EigenFaces methodology as implemented in Open CV to calculate a special kind of face that we have labelled an ‘Anti Face’. – Over 1000 faces were used. – The faces were all facing the camera straight-on. We used a specially designed Haar classifier to ensure that we excluded faces looking to the side. – The faces that we fed into the PCA calculation are slightly larger than what the Haar classifier detected so that we didn’t cut off the chins. – The faces were all subject to histogram equalization. – The faces were all sized to 200×200 pixels. – We took the first 60 eigenvectors. The Antiface calculation is simple: we do a subspace projection of the uploaded face into the 60-dimensional EigenFace space. It is interesting to view this ‘reconstructed face’ as we call it. In a normal face recognition calculation you would then compute the nearest face to this reconstructed face. The anti-face is simply the reconstructed face except that every weight is multiplied by -1. Let Ω ∋ R⁶⁰ be the subspace projection of the uploaded face. Ω=(w₁,w₂,..w₆₀) where wᵢ= uᵢᵀ(Γ-Ψ) for i=1…60. 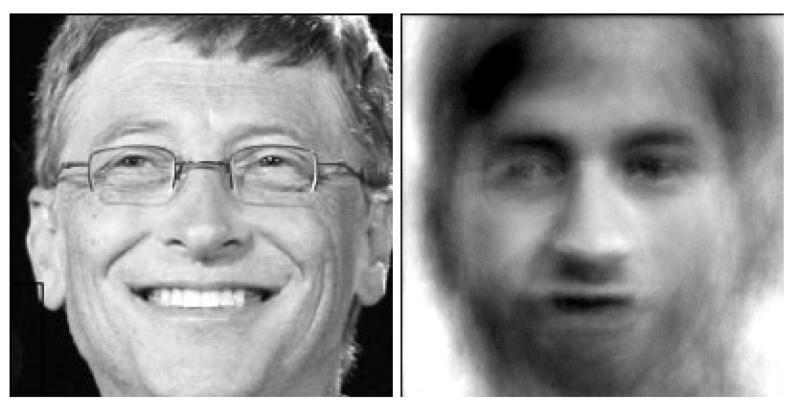 u ∋ R⁶⁰ is the Eigenface. Γ is the uploaded face image and Ψ is the mean face. Then the antiface, Ω’ is (-1*w₁,-1*w₂,..-1*w₆₀). So prominent features in the reconstructed faces (with high weighting, meaning far from the mean) would be equally prominent, though opposite, in the anti-face. Why 60 dimensions? Originally we tried higher numbers like 200 because at that point the reconstructed face looks indistinguishable from the original face. However the anti-face looks very little like a face and is highly distorted and muddied. It seems that it such high-dimension space not everything looks like a face, however in a lower dimension space like 60 you’re likely to get a face no matter where you land.